The CSCP and ICLEI Local Governments for Sustainability join forces to advance sustainable and innovation procurement in German regions and cities as strategic partners to Procura+ Network. As a national focal point we want to bring the Procura+ Network’s activities closer to German cities and procurement departments. Procura+ is a network of European public authorities and regions that exchange, connect and implement sustainable and innovative procurement. Members of Procura+ Network learn and exchange information on the latest progress in innovation procurement, engage in partnerships with procurement professionals and receive individual advice and support on policies, strategies and existing procurement activities. 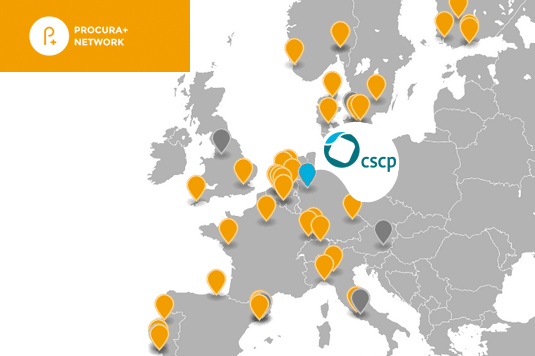 The CSCP will contribute to the Procura+ Nework its knowledge of sustainable supply chains, evaluating positive sustainability impacts of procurement activities, as well as bottom-up engagement of stakeholders for sustainability innovation in cities and city quarters. The Procura+ Award rewards existing innovation and sustainable procurements that result in market improvements of public goods, works, services and infrastructures. Six sustainable and innovation procurements were nominated for this year’s Award. Winners of the Award were announced at the third major eafip event on Innovation Procurement held in Tallinn, Estonia on 17 October. The CSCP invites cities and procurement offices to submit their innovation procurement to the next Procura+ Awards. Please contact Ahmad Hafiz if you have any questions.